Over the last three days the Thames River watershed has received around 50 mm of rainfall with daytime highs in the teens. In addition to the rain, there was approximately 25 to 40 mm of water stored in the snowpack, which has now melted and added to the runoff. Overnight and this morning approximately 10 mm of rainfall has fallen and weather radar suggests that there is still some additional rainfall coming today. Temperatures have begun to drop and are expected to fall beneath freezing this evening. The heavy rains and snowmelt have led to flooding on the smaller local watercourses in the Lower Thames. While water levels on many of those local watercourses are in decline, others are still experiencing flooding due to blockages or localized rainfall. The additional rainfall overnight and this morning will cause water levels to rise again to varying degrees. 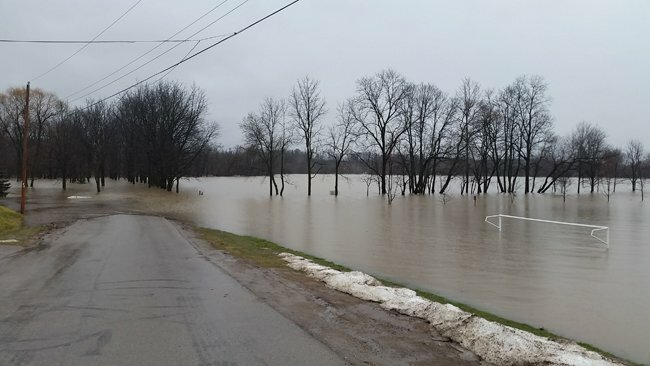 Water levels can be expected to remain high on these watercourses through the weekend, especially those near the Thames River which will start to see water backing up from the river. The Lower Thames Valley Conservation Authority is currently operating the Indian-McGregor Creek Diversion Channel to protect the south end of the City of Chatham from flooding. Water levels on the Thames River in London appear to have peaked now at flows that exceed those observed during the 1977 and 2008/2009 floods. However, today’s rainfall might still boost flows a little more. Downstream areas should expect local flows similar to what they experienced during those events. Peak water levels are expected to reach the Dutton and Southwest Middlesex area tomorrow, and the Thameville and Chatham areas late Friday. All along the Thames River from Delaware to Chatham, the river flats are already flooded. Through Middlesex and Elgin Counties there could also be flooding issues around bridge crossings and other areas where water will be backing up local watercourses. Flooding within the community of Thamesville is expected. In the City of Chatham basement flooding for those businesses backing onto the Thames River along King St. is expected. The timing of that basement flooding is still uncertain and those businesses should be prepared by tomorrow morning. There is also expected to be flooding on some of the low roads adjacent to the Thames such as Siskind Court, the area around William and Water, Salter, the west of Pegley, and the low portion of Thames St along the river. Water levels in the downstream areas can be expected to remain high all through next weekend. The Lower Thames Valley Conservation Authority expects to be operating the 6th Street Backwater Dam and Pumping Station in downtown Chatham by this afternoon. Accumulations of ice on the Thames River around Thamesville and Kent Bridge have now cleared and are moving downstream. Their breakup overnight caused a sudden surge or water levels in the city of Chatham that has now leveled off. Ice downstream of Chatham through to Lighthouse Cove has also now cleared and appears to be pushing out into Lake St. Clair without any signs of jamming. People should take extra caution and avoid the river, ditches, and streams. The combination of slippery banks, broken up or degraded ice, and fast moving cold water can be dangerous. Standing water can also present its own unseen hazards. Children, pets and livestock should be kept away from the water. This message will be in effect until February 23rd, 2018.